Customer service is the true key to a memorable car buying experience. And our Toyota dealer is proud to deliver Boone County, IN, drivers with some of the best customer assistance around. Not all drivers know which models best suit their lifestyles. Fortunately, if they’re uncertain, they can always turn to our sales consultants for help selecting. We’ll listen to all your needs, pairing you with the car that best fits. We’ll even let you get behind the wheel first, so that you can know for sure if the car is the right choice. At our Boone County, IN, area Toyota dealer, you’ll have all the financial assistance that you need. Whether you’re leasing or buying, we’re committed to taking care of all the legwork for you. For example, if you need to secure an auto loan for your car, we’ll be the ones to reach out to lenders for you. In the end, we’ll go through as many as we can to find the right terms for you. One of the most important aspects of vehicle ownership is maintenance. In order to keep your car running at peak performance, you’re going to need to keep up with routine maintenance and repairs. Doing so can head off more expensive work down the road. The technicians at our Boone County area Toyota dealer have both the skills and tools to take care of all your vehicle needs. As soon as your car needs any service, contact them online or over the phone to schedule an appointment. As a moderately sized county with 56,640 people, Boone County is one of the hearts of this region. Named for the famous Daniel Boone, an avid frontiersman, Boone County contains some of the area’s best parks. From Mulberry Fields to Starkey Nature Park, there’s no shortage of winding hiking trails and picnic groves. Whether you’re heading to the park or to dinner at Cell Block 104 Restaurant & Bar, you’re going to need a reliable car to get there. And our Toyota dealer is happy to provide all Boone County drivers with just that. When you’re shopping with our Toyota dealer near Boone County, IN, finding the right car for your needs isn’t difficult. As a matter of fact, it’s something you can get started on right from the comfort of your own home. 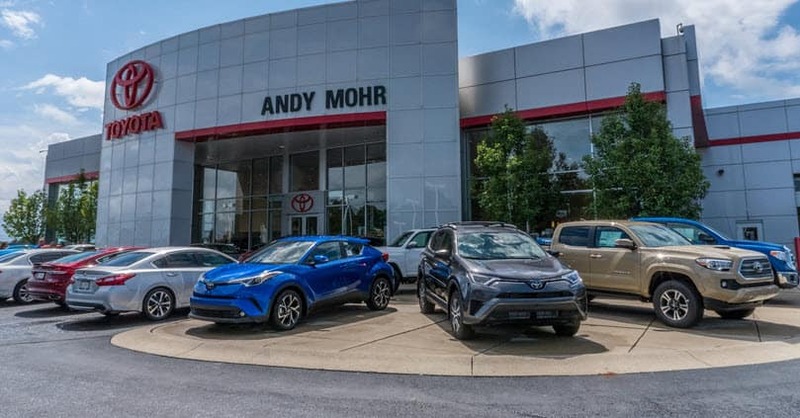 Start finding your next car with Andy Mohr Toyota. Browse our online inventory of new, used, and certified pre-owned vehicles now!